In 1978, Jim Harpe founded J. Harpe Realty, which has specialized in waterfront homes along the lakeshore and residential homes in the Grand Rapids area. Jim’s expert knowledge and first-rate personal service has helped him secure millions of dollars in transactions for his clients. 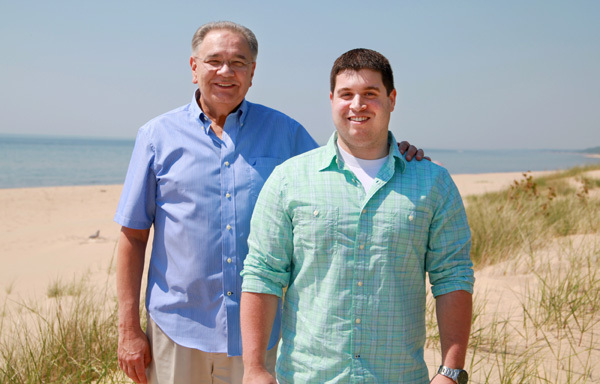 Even though his son and fellow real estate agent, Steve, teases him a little about his type A personality, it’s Jim’s laid-back, fun-loving side that will make buying or selling your home an enjoyable experience for you. Call Jim today to find out how his expertise can help you buy or sell your home successfully. Jim is a real estate broker who is also a member of the Grand Rapids Association of Realtors, the West Michigan Lakeshore Association of Realtors®, and the Michigan and National Associations of Realtors. A graduate of the Realtor’s Institute, Jim is also a Certified Residential Specialist, a certification achieved by less than 5 percent of all Realtors nationwide. Prior to earning his real estate certifications, Jim graduated from Indiana University with a physics major, and math & chemistry minors. Jim’s bride, Jan, retired as Director of Speech and Pathology for a leading non-profit organization in 2012. Married since 1977, they have a son, a daughter, two granddaughters and a grandson. When not selling homes Jim likes traveling, reading and spending time with his family. Call Jim today at (616) 340-7478. At the age of 20, Steve Harpe wanted a career that would suit his competitive spirit, his high energy level and his desire to work closely with people. When his dad, Jim, spoke to him about the family business, Steve knew he had found his calling. With more than a decade of experience as a West Michigan real estate agent, Steve has the know-how and enthusiasm to help you successfully buy or sell your home. Steve is a multi-million dollar producing real estate broker who is a member of both the Grand Rapids Association of Realtors and the National Association of Realtors. A graduate of the Realtor’s Institute, Steve is also working towards becoming a Certified Residential Specialist, the highest credential awarded to Realtors. When Steve isn’t studying or negotiating the best deal for his clients, you’ll probably find him on the golf course, unless it’s game day for the Indiana Hoosiers. In that case, you’ll find him watching the game with his dad. Steve also volunteers with Habitat for Humanity and attends Keystone Community Church. He shares his home and his heart with his wife, Krystine, along with a couple of cats and dog. Call Steve today at (616) 633-1623. Jim & Steve are a father and son team that provide prompt, professional, and personal service. Brian Flickinger has been working full time since the age of 14 in many different settings. From running his fathers home repair business, supervising at Michigan’s largest landscaping company, to taking professional photos for J. Harpe Realty, Brian’s experience has helped him form a well-rounded skillset and work ethic. Brian joined J. Harpe Realty in 2016. His ability to establish relationships and bring new innovative ideas to the table has proven to be a valuable asset to the J. Harpe team and his clients. Brian is a graduate of Grand Rapids Community College and the Gap;an Real Estate Institution. He is also a member of the Grand Rapids Association of Realtors and the National Association of Realtors and is on track to become an Associate Broker for J. Harpe Realty. Living on Bostwick Lake in Rockford, Brian spends a lot of time in his office enjoying the view of the lake and working for his clients. Growing up in a family with Hall-of-fame bowlers, Brian has been bowling at Northfield Lanes since he was 2. He also is an avid skateboarder and work with AGA Sports Nation promoting action sports and safety affiliated with Spectrum Health. Call Brian today at (616) 644-3360. © 2016 J Harpe Realty. All Rights Reserved.